Barely eight day to the commencement of the much-awaited general elections, a sociocultural organization, Oranmiyan group, in Osun state, Thursday kicked-off a door-to-door campaign for the re-election of President Muhamnadu Buhari, his vice Prof. Yemi Osinbajo and all candidates contesting on the platform of All Progressives Congress (APC) in the coming elections. Irewole, Osogbo, Olorunda, Iwo, Ayedire, Olaoluwa, Ifelodun, Odo-Otin and Irepodun local government areas explained that the impressive performances of President Buhari and Osinbajo in almost four years has been the campaign strategies it has had to use to mobilise support for the President’s re-election. Among the notable people met during door-to-door campaign are the APC party excos at the ward and local councils, youths, state coordinators, interest groups, market women, religious leaders , youths among others. 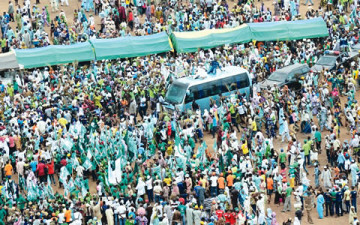 Sadiq, who later led hundreds of APC supporters on a roadshow of some strategic streets and highways, canvassed passers-by, residents, commuters, transporters as well as market men and women, with the candidacy of President Buhari, Osinbajo ticket, saying, “to take Nigeria to the next level as they remain the best team for the job. “Nigeria has been in ruins for 16 years in the hands of Peoples Democratic Party, PDP, which is seeking a return on this general elections. According to DG the group embarked on campaign from the area because of the strategic, numerical strength and advantage to galvanizing votes for the victory of the incumbent president, as well as the need to take the message to support the team to the real grassroots. His words, “Therefore, we are organising this campaign as group that is complimenting the other initiatives of the Presidential Campaign Group that is moving across the States. “We plan to move the train to the nooks and cranny across of the three Senatorial Districts of the state. We are resolute to work for the reelection bid of President Buhari because of his huge developmental stride achieved within almost four years of assuming office.